Web has become faster and now we tend to share, view more videos like never before. With screencasting [recording screen movements] getting easy, more computer users are recording screen movement and further saving / sharing resultant videos. It is an effective way to visually represent a specific task and is ideal for tutorial or guide videos. Here are few ways to perform screencasting online or offline on your computer. 2. GoView – Citrix brings this new online screen recording service. Besides the ease of recording videos, you can also snip any part of the video, add title and of course share videos. Quality of resultant videos is impressive. 4. 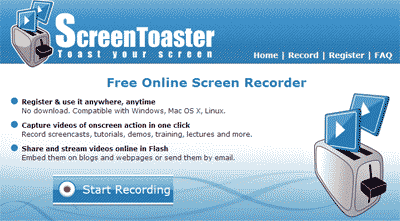 ScreenCast – Name says it all, it is an online screen recording web service. You can create and store videos on the ScreenCast website. However, everything isn’t free. It has both free and paid accounts with resource limits of storage and bandwidth. 5. ScreenCastle – It is another useful and easy to use online screen recording web service. Just record within web browser and save / share resultant videos. 6. Camtasia Studio – It provides complete professional solution for recording, editing and sharing high-quality screen videos. It has lot of features for refined resultant videos. 8. Webinaria – It allows you to create Flash (AVI to FLV) recordings of your desktop. You can record voice commentary with your presentation and also support editing of your recordings to add voice, webcam or text. 9. Screen Recorder for Mac – It is a screen recording tool that allows the user to capture the screen as a QuickTime movie. 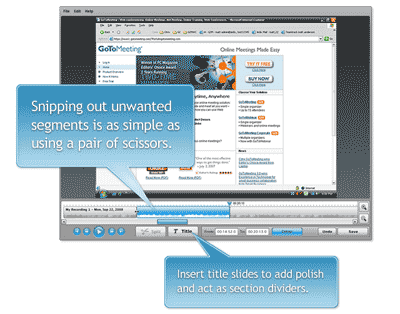 It is useful for creating training CDs, visual tutorials, and much more. It can even be used as a monitoring device. 10. Few more software options (not free) – Demo Creator, Desktop Screen Record, Screen Movie Recorder (Mac) and Total screen recorder flash. Maybe good additions to this list are the checklist of criteria for selecting a screencasting tool at indoition.com/screencasting-tool-choosing.htm, as well as the list of screencasting tools at indoition.com/screencasting-tools-survey.htm. You missed out on SnagIt though as it lets you record screen too.